Jack Dorsey’s beard, if the new CEO of Twitter thing doesn’t work out, also will qualify him for membership in ISIS. Or as Amish. Hipsters need options. Ted Rall commentary in aNewDomain’s new SkewedNews. aNewDomain/SkewedNews — Jack Dorsey, the corporate hipster who is now running Square, looks like he is likely the next CEO of Twitter. As such he will be first major head of an American corporation to wear a serious Nebuchadnezzar beard. The beard even has its own parody account, @dorseysbeard. At age 38 — nearly a decade after maximum hiring age in Silicon Valley — Jack Dorsey would face a daunting challenge were he to accept Twitter’s offer to return to the company he helped found. Dorsey is currently running Twitter as interim head, and has made no progress yet on the shockingly difficult puzzle of how to monetize billions of brainfarts under 140 characters. Dorsey’s beard may be a xenomorph. Dorsey’s beard is nothing short of xenomorphic, I think. It has appeared in several forms. It appeared first in non-existent form. At the rate this crazy beard is going, if the techdouche thing doesn’t work out, Dorsey will qualify for membership in the radical Islamist group ISIS. Or with the Amish. Who wants to be the next CEO of Twitter anyway? Sources on Wall Street and in Silicon Valley say Dorsey stands to become the first owner of a credible hipster beard to become the chief executive of a major American company in memory. Sources are sometimes right, I’ve found. Hipsters are not hip, by the way. For the uninitiated, 2015-era hipsters are not “hip,” as the hippies of the 1960s and 1970s called it. Nor are they hipsters in the Jack Kerouac vein. Dorsey was asked about his beard on CNBC. “People shouldn’t be measured by what they look like,” Dorsey replied. He is evidently unfamiliar with visual media, not to mention two million years of human evolution. “Not a fan of the beard,” Dorsey’s mom Marcia tweeted. “Twitter CEO Jack Dorsey sparks shock and awe with lush corporate beard,” said Mashable, which is strangely also still in business as of this writing, oohing, and partially ahhing. Asked for comment via Twitter direct message, ISIS leader Abu Bakr al-Baghdadi has not gotten back to us. Neither have the fabled Bubbas with Beards. And we’re worried about that. What if, like everyone else, he’s moved on to Instagram? Weirder things obviously have happened. Ed: The original version of this story ran earlier today on aNewDomain’s SkewedNews. Read it here. 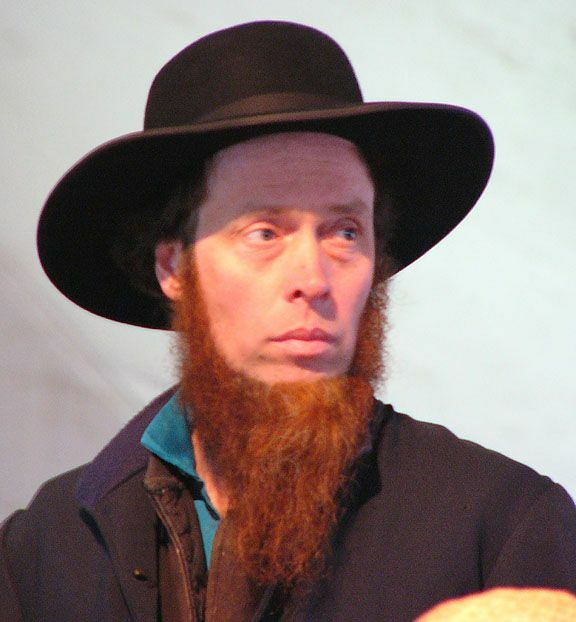 Image of Amish man with a red beard: Pinterest.com, All Rights Reserved. I think that beard does!